The upper tube assembly (UTA) is built around two aluminium bicycle rims. These rims have a 21½ inches inside diameter and 23 inches outside diameter. 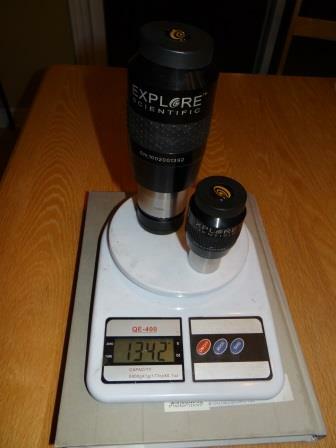 For a 20 inch f/3.9, this was an ideal size since no significant vignetting is introduced and the aluminium alloy used, as well as the profile shape, make for two strong, yet lightweight rings (1 pound each). The two bicycle rims are 14 inches apart, separated by 5 aluminium U channels like those found in hardware stores. 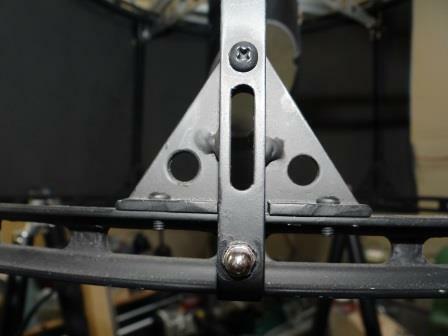 The U channels attach to the bottom rim through a small triangular gusset reinforcement plate to which the channels are tack welded. As for the top ring, the U channels are attached only with a bolt. Like in the rest of the telescope all the nuts and bolts used to assemble the UTA are either stainless steel, brass or aluminium. I describe these unusual truss pole configurations in more detail here but you will notice the truss poles are not side by side, like in most truss telescopes, but instead one in front of the other. This was a prefered configuration because the attachement points are on the side of the bottom ring rather than on the bottom of the ring. 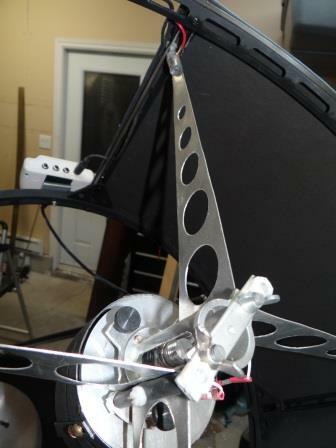 When it first became operational, the 20 inch needed about 15 pounds of counterweight behind the mirror to prevent the tube from falling to the ground. 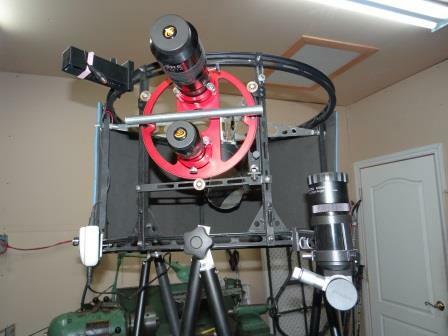 Today the scope can operate with no counterweights (although it is slightly better balanced when 2 pounds of counterweight are added behind the mirror). 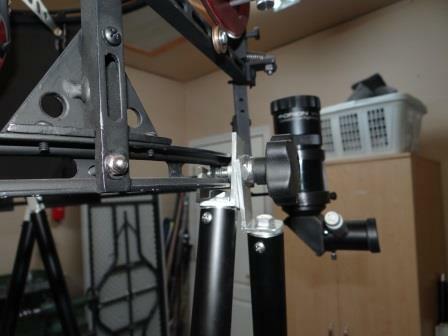 Slotting all the structural components and redesigning the diagonal holder reduced the weight by about 2¼ pounds. 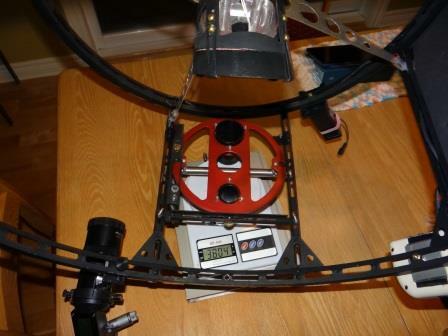 Switching from 1¼ inch Moonlite truss tubes to 1 inch ones and adding an onboard 12 V rechargeable battery attached to the hemisphere did the rest. So, in spite of it’s lightweight, is this UTA robust and rigid? It has issues and should be more robust. 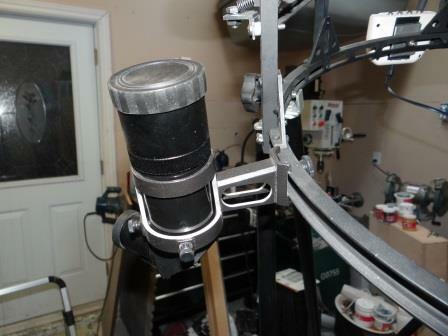 I’ve noticed a laser pointed throught the 1¼” eyepiece holder and projecting onto the center of the mirror will move by almost ½” as the telescope moves up and down in certain tube positions. I believe this is due to the top ring deforming. Indeed, I’ve noticed with using bicycle rims and spider vanes arranged like this: >o< is that if you squeeze the outer periphery of the upper ring with your hands, the diagonal mirror rotates slightly due to the rim deforming. I working on improving this problem.